Matias del Campo, architect and co-founder of SPAN Architects has had a long association with HP DesignJet technology, relying on these large format inkjet printers for his work. This year marks the 25th anniversary of the launch of the HP DesignJet series by HP. HP completely reinvented large-format design in 1991 with the introduction of its first large-format inkjet printer called HP DesignJet. The technology has evolved over the years with the company continuing to set the benchmark for speed and high-quality output in large format printing. Over 3.3 million HP DesignJet products have been sold since the first large-format printer in 1991. On the occasion of HP DesignJet’s 25th anniversary, Matias del Campo, architect and co-founder of SPAN Architects, reflects on some of his career milestones, with HP DesignJet technology supporting him all the way. The launch of HP DesignJet products quickly transformed the industry by making large-format CAD printing affordable and easy to use. The first HP DesignJet, a monochrome A0 printer with 300dpi, printed an A1/D-sized print in draft mode in a ground-breaking speed of about four minutes. This was followed by a colour model and the introduction of line width in HP-GL/2 (HP Graphics Language), considered an industry standard today native to all HP DesignJet printers, for more accurate line rendering. Matias del Campo’s relationship with HP began when he was a student of architecture at university, printing his plans on the HP DesignJet 1000 introduced in 1999. By this time, HP had already launched 54 products and registered over 2,200 patents. An A1/D-sized line drawing could now be printed in under half the time of the first HP DesignJet, in about 1.5 minutes and at higher quality. The HP DesignJet 1000 was a 1200 x 600 dpi printer using four separate colour printheads. Recalling his earliest experiences with the DesignJet, Matias del Campo said the quality of line drawings and the print speed were amazing. He could illustrate very complex designs very clearly, whether they were CAD line drawings or full colour renderings. In his first job, the architect’s studio printed plans on HP DesignJet printers at a local copy shop. Over the years, he has been surprised by the increasing capabilities of newer models, which offer faster print speeds and higher image quality. Line width in the first HP DesignJet printer was 0.38mm (0.015 in). When HP launched two of its best-selling products in 2000, the HP DesignJet 500 and 800, offering a range of connectivity options dedicated to workgroups, line width was down to 0.04mm. Today, the minimum line width on the HP DesignJet T830 MFP is down by half again, to just 0.02mm. 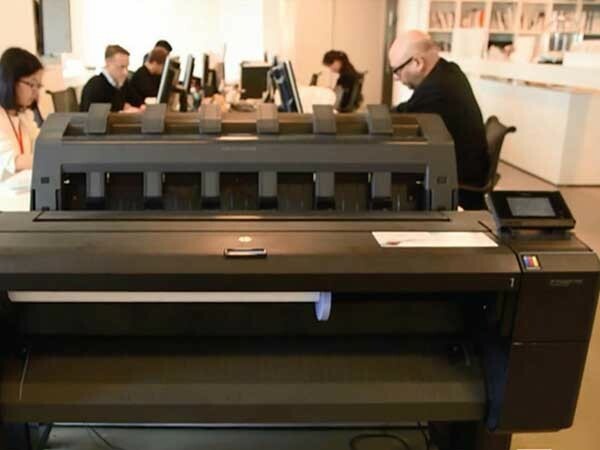 When del Campo set up SPAN Architects with architect Sandra Manninger in 2003, HP DesignJet had recently introduced a family of affordable multi-format printers, allowing the firm to compete with established design studios. The multi-format HP DesignJet printer was perfect for their small studio working on a limited budget, as it helped them save costs on outsourcing as well as compete for more projects. The printer’s speed enabled them to print and bind six or seven presentation folders in full colour for roundtable pitches, whereas other studios printed one and handed out black and white photocopies. Throughout del Campo’s career, HP DesignJet technology has delivered affordable solutions that consistently anticipate the challenges faced by any business. According to the architect, HP has democratised the ability to compete for projects. He believes one can still compete on a larger scale with an HP DesignJet printer, without being a large company. Today SPAN Architects, with offices in Detroit, U.S.A. and Shanghai, China exploits leading edge construction methods and technologies to create affordable projects with appealing designs. Projects are printed and shared using a 36-inch, web-connected HP DesignJet T920 printer. In 2010 HP DesignJet introduced the first ever integrated, large-format multi-function printer, the HP DesignJet T2300 MFP. As a member of HP’s Mentors and Experts panel since 2007, the eMFP with ePrint & Share simplified and accelerated development of del Campo’s project at the Shanghai expo. For last-minute design changes, del Campo printed the plans, made handwritten annotations on the prints, scanned the changed plans and sent them back to the Chinese office printer. del Campo explains that today’s international business environment demands the ability to manage and instantly deliver designs across locations. With their projects coming out of China, they frequently don’t share the same room, the same country, or even a spoken language. However, the large-format printed plan facilitated by their HP DesignJet printer allows him to sit down at a table, pen in hand, and discuss changes with the customer in China without any cultural or language barriers. Both partners at SPAN hold teaching posts at the University of Michigan, travelling between the University, their offices in Detroit and in China. del Campo says their geographical location is no longer an obstacle to their professional ambitions. He explains that their printer gives them peace of mind as they know they can quickly respond to the latest challenge on any project in any part of the world. SPAN is currently involved in the interior design of flagship stores for world renowned brands in a number of locations in China and designing a 1,200-housing-unit development project in Jakarta, where they are exploiting modular construction techniques to create distinct, attractive designs that remain affordable. Describing the performance of his HP DesignJet T920 printer, del Campo says a full colour rendering is now also dry straight off the printer without any waiting or smudging. HP DesignJet printers also offer an incredible set of tools, services and features that simplify his professional life. The latest HP DesignJet T830 is a robust integrated multifunction printer equally at home in office environments or at challenging construction sites, to accelerate project completion and minimise costly delays. The mobility features of HP Mobile Printing not only provides the flexibility of continuous collaboration by sharing the scanned documents from mobile devices, but also gives the freedom to print from anywhere in total connectivity to match the current industry transformation. del Campo is constantly amazed by HP’s ability to consistently develop and incorporate solutions and services that transform the design workflow for architects. He says HP reaches out to designers and creates easy-to-use solutions that respond to their needs. From the time he used an HP DesignJet printer as a student of architecture to print his first plans to the present day when the company is celebrating its 25th anniversary, HP DesignJet printers have remained at the forefront of printing technology offering seamless integration and web-connected operation, ease of use, and accessibility to even non-expert users.